Can't wait to see what everyone else wrote this week (if I missed it)! This week's post is the one I wrote today that contains a tutorial for a earring holder as well as a GIVEAWAY!! We move to AL and suddenly my son develops an obsession with trucks. Coincidence? I think not. I invited a friend to share photographs from his pheasant hunting trip to South Dakota. They are posted from January 2 through January 6. He was very secretive about his favorite hunting location so all I knew was central South Dakota. 7. Magic City Post - 99 things we LOVE about Birmingham (and you will, too). 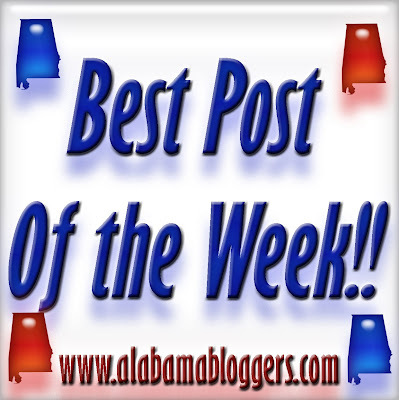 Looking forward to seeing all of you Wednesday at Mellow Mushroom Inverness (Birmingham) for the Alabama Bloggers lunch! My post of the week is about depression. This time of the year is emotional challenging to a lot of people-holidays, lack of sun, life changes, new beginnings can all be overwhelming. I wanted to share a few tips and links so that if you are experiencing depression, you know you are not alone and their is potential in healing! Finally getting back into the studio after a hectic holiday season of filling orders and visiting family in MS. This post is about my first batch of pottery for the new year.